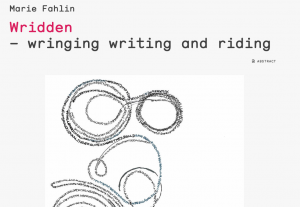 Researching (in/as) Motion: A Resource Collection, is edited by Vida L Midgelow (Middlesex University), Jane Bacon (University of Chichester), Paula Kramer (Uniarts Helsinki), and Rebecca Hilton (Stockholm University of the Arts). Our purpose with this open access, online resource, is to fill a gap in the resources for doctoral candidates, addressing the limited materials available to researchers who are perhaps stuck, entering a process (perhaps for the first time), wanting inspiration, help or reassurances. We have sought to fill the gap between all those generic ‘Introduction to Research Methods’ books, and the numerous ‘How to Complete a PhD’ texts. These texts hardly ever attend substantively to Artistic Research and are generally written in dry, off-putting, ‘cleansed’ ways. We seek too, to avoid case study approaches, that illustrate neatly completed artistic doctorates, and step away from the oft revisited forays into the ontological and epistemological discourses of Artistic Research. Such texts are vastly useful – but they say little about the real ‘doings’ of Artistic Research within the doctorate. 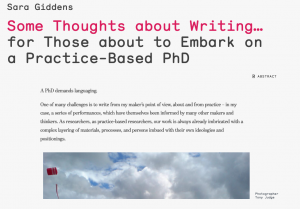 We have sought to find something in-between; something that reflects both the particularities and peculiarities of Artistic Doctoral research, while addressing key recurring approaches and concerns in Artistic Research. 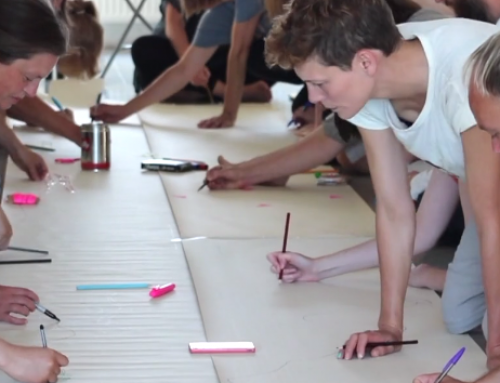 To achieve this aim we asked contributors to consider how they might provide resources for others; offering handrails, ideas and perspectives for those undertaking an artistic doctorate in the performing arts or wondering if that would be a good thing to do. The diverse materials – by some forty-six authors- each in different ways, reveal how to work effectively with tacit knowings, attend to the vagaries of the situation and acknowledge the centrality (but not unproblematic nature) of first person, ‘expert practitioner’, research. 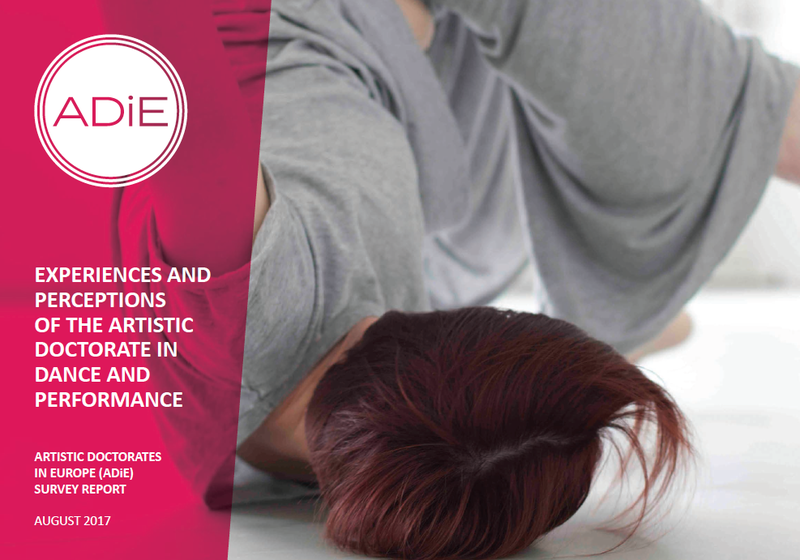 Working from the premise that the artistic researcher in dance and performance uses aesthetic, embodied, material and language based ways of knowing, the collection sits at the interface of choreographic and somatic processes when immersed with reflective/conceptual/philosophical thinking, supporting the researcher through what are often uncharted, emergent processes that entail getting lost, being vulnerable and taking risks to develop new understandings and new practices. The authors in this collection have shared creative-corporeal-material-critical approaches to Artistic research, offering discursive and poetic writings, prompts, hands-on and workshop style tasks, games, scores and the like. In turn, we in invite readers to engage with these diverse contributions by activating the materials – such that reading and doing blur through in motion, lived and experiential explorations. We hope this collection will enable readers to act (make real, take action, to make a difference) through the ways the material resonates via embodied experiments and active questioning. 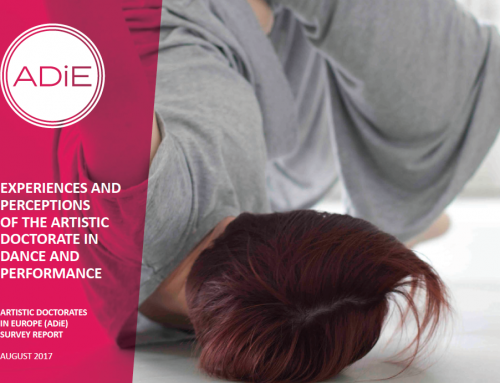 ADiE have also published ‘Reconsidering Research and Supervision as Embodied Creative Practice: Notes from the field’ (Jane Bacon and Vida Midgelow). These two publications can usefully be read as companion works.